From the VIP vantage point of the Pearl Observatory restaurant Perlan, view one of the most spectacular displays of fireworks in the world. Learn about Icelandic folk culture as you explore the turf homes, schoolhouse and artifact collections of the Skogar Museum. Soak in the mineral-rich, geothermally heated waters of the famous Blue Lagoon. Participate in one of the world’s most unique celebrations of the New Year in Reykjavik, Iceland, where ancient traditions and modern technology combine in spectacular fashion. First appreciate the stillness and beauty of the Icelandic countryside at the waterfall Gulfoss and along the scenic southern coast. Discover Thingvellir National Park, where Vikings met and formed the world’s oldest parliament. Then, join Icelandic families around their celebratory New Year’s Eve bonfires, enjoy a gala dinner and watch the amazing fireworks display. Activity note: Check-in available from 2:00 PM. Please make sure to pack your bathing suit in your carry-on luggage, as we are visiting the Blue Lagoon on our way to the first hotel. Breakfast: Buffet breakfast at the Northern Light Inn. On this program, breakfasts will offer a typical European style breakfast buffet with breads, cheeses, cold-cuts, yogurt, fruit, cereals, juice, milk, coffee, tea and water. Please note that water is included in the program cost at all meals. Morning: After breakfast, drive to the Blue Lagoon. Begin your Icelandic experience with a relaxing soak in the mineral-rich, geothermally-heated waters of the Blue Lagoon. (Entrance and towels included.) Fully refreshed, continue to the city of Reykjavik and check in at the hotel. Lunch: Explore local fare on your own. Afternoon: Free time to relax or explore a little in downtown Reykjavik. Program Introduction will be at dinner. Your Group Leader will greet everyone and lead introductions. We will review the program theme, the up-to-date Daily Schedule and any changes, discuss safety guidelines, emergency procedures, roles and responsibilities, and answer any questions you may have. Indicated times are approximate. Program activities, schedules, and personnel may need to change due to local circumstances. In the event of changes, we will alert you as quickly as possible. Thank you for your understanding. Dinner: Welcome dinner and introduction. Experience traditional Icelandic cuisine at Lækjarbrekka, one of Reykjavik's most historic restaurants, located in a charming old building of Reykjavík. Unless otherwise noted, dinners on this program are typically a three-course set menu. 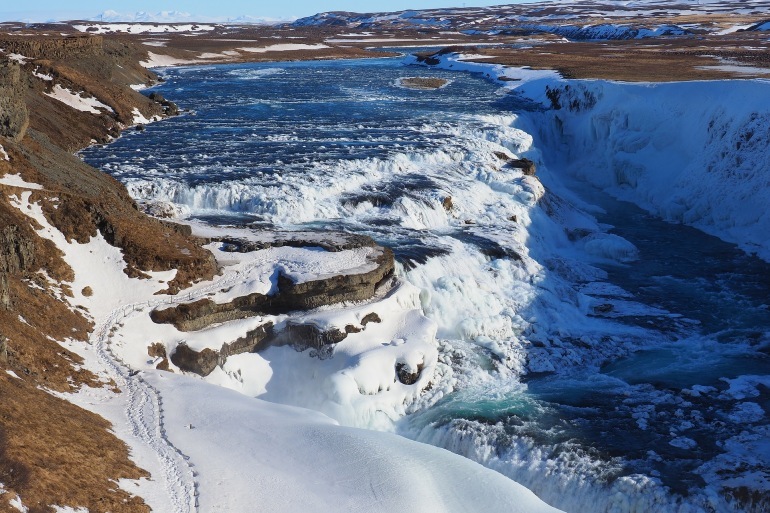 Morning: As the morning light brightens, depart to the golden waterfall — Gullfoss. Experience the stillness and beauty of the wintry countryside and the frozen waterfall. Continue to Geysir, where the active Strokkur Geyser bursts forth every few minutes in a cloud of steam. Discuss how geothermal energy is used to provide hot water, heat and grow vegetables. Lunch: At a local restaurant. Unless otherwise noted, lunches on this program are typically a two-course set menu. Afternoon: Return via Thingvellir National Park, the site of the original Parliament and the most sacred place in Iceland because of its geological and historical significance. The Althing, or General Assembly, was established in 930 CE and is the world’s oldest existing parliament. Not only historically significant, the site is located on the meeting point of the American and European continental plates. Activity note: Participants are encouraged to bring warm shoes, a scarf and hat for the bonfire. Morning: Discover Europe's northernmost capital on an expert-led visit of Reykjavik with your Group Leader, a National Guide of Iceland. Afternoon: Free time. You may wish to visit the Reykjavik Art Museum, The Culture House, or the Volcano House. Another option is to take a walk around Lake Tjornin in the center of Reykjavik or up to the Church of Hallgrimur for a great view of the city. Your Group Leader will provide directions and advice as needed. Dinner: New Year’s Eve celebration with a festive 5-course gala dinner at the Grand Hotel Reykjavik. There will be entertainment and live music. Evening: Set out to experience the bonfires that kick off the evening’s celebration in each community surrounding Reykjavik. Mingle with locals, as no one misses the annual bonfire! Each town vies for the reputation of having the best. Return to the hotel for coffee and dessert. From your vantage point, watch as the entire sky, as far as the eye can see, fills with fireworks as midnight approaches, building to an endless explosion of light and color that are of a beauty and magnitude like nowhere else on earth. Activity note: Due to winter weather and distance, you will spend approx. 5-6 hours on the bus today, driving along the South Coast. Morning: Depart Reykjavik in the late morning to journey along the scenic south coast. The white snow and black lava contrast starkly in the peaceful winter landscape. Afternoon: Visit Seljalands waterfall and the Skogar Museum of folk history. Return to Reykjavik in the late afternoon. Dinner: Hotel dining room. Enjoy a festive dinner as the hotel greets the New Year. Morning: Check out of the hotel. View the recent archaeological discovery of the city’s origins during an expert-led visit of the Reykjavik Settlement Exhibition, then depart to the National Museum. After an expert-led introduction, view the exhibits independently. Lunch: A light lunch in a local restaurant. Afternoon: Depart to Keflavik International Airport (KEF). This concludes our program. The Grand Hotel Reykjavik is a beautiful hotel that offers first-class amenities and service. It is the first hotel in the world that was designed and built to control pollution from its electrical supply, working to eliminate electro-magnetic pollution. The Grand Hotel Reykjavik also recently opened a new tower, and is now the largest hotel in Iceland. Situated in a quiet location, it is within walking distance of Laugardalslaug, Iceland's largest swimming pool.